With the reduction in the distribution of printed business directories and the ever increasing use of searching online to find local businesses, it is good practice these days to devote your marketing budget to online channels that will give you the best return on investment. However nowadays, just getting your local business website online is simply not enough. The search engines such as Google, Yahoo and Bing rely on a range of secret criteria to decide whether to place a website on Page 1 or Page 101. Also today just about every business has a their own website. For instance, if you run a search for “locksmith leeds” you will get a result similar to the image below. 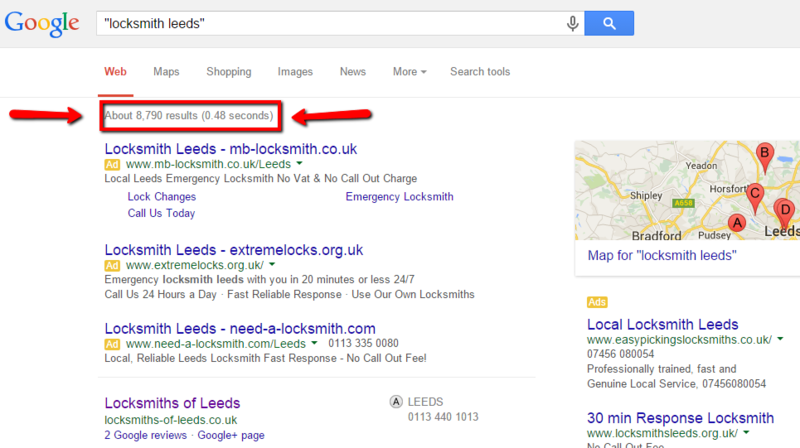 The highlighted box shows you that Google found 8,790 websites with the term “locksmith leeds” in them. So depending on what type of business you have you could be competing with thousands of other companies for the 10 slots on page one. If your business website is not listed on page one of the search engines then you are losing money to your competitors. When a your potential customers sees your web site on the first page of Google, they immediately look on your company as a leader in your marketplace. This is where an SEO Expert comes in. Search Engine Optimisation (SEO) in a nutshell is simply optimising the pages on your business website and helping it to develop trust with Google so it will move up onto page 1. If you notice in the image above the top three places are paid adverts, as are the two at the right hand side. Paid adverts can work, but when did you last click on an advert? When a website is displayed on the search engine pages this is known as a “natural” or “organic” ranking. There have been a number of studies that have shown that the organic listings get approximately 90% of clicks and the ads share the other 10%. You can check out the 2015 study here. The site at the bottom is in what’s known as the Google maps listing. There used to be seven slots in the maps but now there are only 3 on display. This was changed in August 2015. You will only get in this spot if you have a Google Business Page, but is is obviously a good position to be in. As a business owner you’re no doubt a busy person with the normal daily tasks of running a business. So can you spare the time to learn how Search Engine Optimization works and then implement it correctly for your website? As an SEO Expert you would also need to ensure that you keep up to date with all the current Google updates. Google will update its search engine algorithms approximately 500 – 600 times in a year. Would you have the time to keep up to date with all the changes? I think as a business owner you’ve more than enough things to occupy your mind with running your company, without trying to learn and keep up to date with Local SEO strategies. 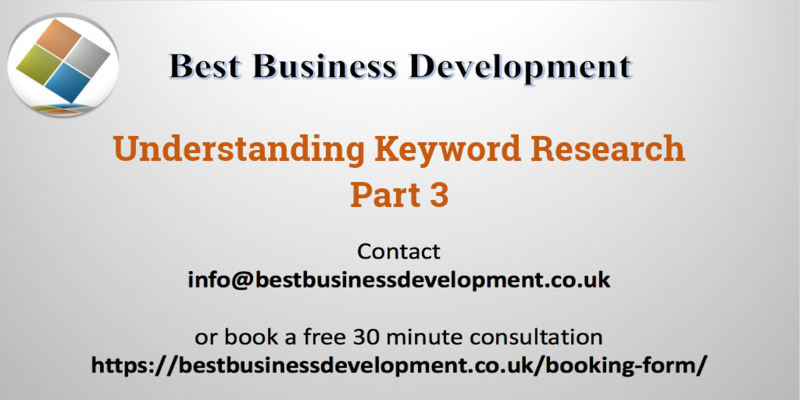 We are your local SEO Company Leeds and this is what we do. Our SEO Expert understands how the Google algorithms work and they are constantly updating their knowledge on what is happening in the world of Google. When you utilise our SEO expert he will sit down with you and discuss your business needs and wants and then develop a customised SEO strategy to suit your company. If you want to rank locally for Leeds then our strategy will be to get your details listed in all the major “local directory” sites. Each of these listings will then be optimised for the Leeds services you offer. Your competition is probably not employing such aggressive local SEO services as we will be. However, it does not matter whether you want to be on the first page for Leeds, or you want to be on the first page nationally throughout the UK or even the world. 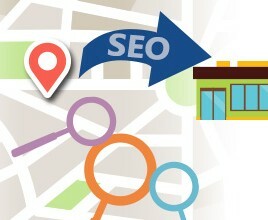 Our SEO Expert can develop an SEO strategy to fit your requirements. Our SEO Expert is constantly testing all the SEO Strategies we use to increase a businesses online profile. Once you have decided that you want to dominate Google then we will begin by first doing a website analysis. We will then fix any errors we have found and optimise it to get it heading towards the first page of the search engines for the keywords you have selected. We take a great deal of pride in our work we guarantee that we only ever use the current best practices and techniques that have been proven to work when developing your online profile. As part of our ongoing service and commitment to you we will send you monthly reports showing what we have been doing and the progress your website is making. As an SEO Company we can help you dominate the first page by developing a bespoke online strategy for you. For a FREE consultation with our Leeds SEO Expert call us today. While you are here why not get a FREE SEO Analysis. Simply drop your URL into our Website SEO Analysis tool, and in a minute or two you will know if your website has any issues that require your attention.